The Monterey Jazz Festival, the longest continuously-running jazz festival in the world, has presented nearly every major jazz star—from Billie Holiday and Louis Armstrong to Esperanza Spalding and Trombone Shorty—since it was founded in 1958. World-renowned for its artistic excellence, sophisticated informality, and long-standing mission to create and support year-round jazz education and performance programs in local, regional, national, and international venues, the Monterey Jazz Festival on Tour 55th Anniversary Celebration continues this commitment in 2013 with its third North American tour. 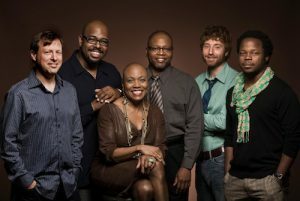 Featuring leading critically acclaimed, GRAMMY®-winning jazz artists, the all-star band consists of bassist and musical director Christian McBride, vocalist Dee Dee Bridgewater, saxophonist Chris Potter, trumpeter Ambrose Akinmusire, pianist Benny Green, and drummer Lewis Nash. Embracing the past, present, and future of jazz, Monterey Jazz Festival on Tour 55th Anniversary Celebration will perform an assortment of classic jazz repertoire and original compositions by band members. Few entertainers have ever commanded such depth of artistry in every medium as vocalist Dee Dee Bridgewater. Fewer still have been rewarded with Broadway’s coveted Tony Award (Best Featured Actress in a Musical – The Wiz); nominated for the London theater’s West End equivalent, the Laurence Olivier Award (Best Actress in a Musical – Lady Day); won two Grammy® Awards (1998’s Best Jazz Vocal Performance and Best Arrangement Accompanying a Vocal for “Cottontail” – Slide Hampton, arranger, from Dear Ella); and France’s 1998 top honor—the Victoire de la Musique (Best Jazz Vocal Album). Taking over the reigns of Jazzset from the illustrious Branford Marsalis, Bridgewater continues to bring her message to listeners. NPR’s JazzSet with Dee Dee Bridgewater is the jazz lover’s ears and eyes on the world of live music. Over the course of her career, Bridgewater has paid homage to monumental figures of the music world, recording albums dedicated to Ella Fitzgerald (the Grammy Award-winning Dear Ella, 1997), Horace Silver (Love and Peace: A Tribute to Horace Silver, 1995), and Kurt Weill (This Is New, 2002). Her latest recording, 2010’s Eleanora Fagan (1915-1959): To Billie with Love from Dee Dee honors iconic jazz figure Billie Holiday. The Grammy Award-winning bassist Christian McBride has been at the forefront of jazz since he emerged as part of the talented generation of players that took the genre by storm in the early 1990s. He has performed live and/or recorded for Sting, George Duke, Chick Corea, Chris Botti, John Scofield, Jim Hall, and dozens more. He won a Grammy Award for his participation on McCoy Tyner’s Illuminations (2004), performed with the Godfather of Soul James Brown at the Hollywood Bowl, recorded with and acted as Musical Director for Queen Latifah, presented Charles Mingus’ Epitaph in LA, Chicago, and NYC, and performed with Sonny Rollins and Roy Haynes at Carnegie Hall. McBride has also pushed the boundaries of jazz with the Philadelphia Experiment and has released two recordings, Vertical Vision and Live at Tonic with his own group, the Christian McBride Band. He has also cultivated new sounds with his eclectic, anything-goes-electro-acoustic Christian McBride Situation, which can include DJs as well as traditional instruments. McBride is the Artistic Director at the Jazz Aspen Snowmass summer program, the Co-Director of The Jazz Museum in Harlem, and is Creative Chair for the Los Angeles Philharmonic. In 2010, McBride won his second Grammy for Five Peace Band: Live, a project featuring Chick Corea, John McLaughlin, Kenny Garrett, and Vinnie Colaiuta. McBride won his third Grammy in 2012 for Best Large Jazz Ensemble for The Good Feeling (2011), his first big band recording as a leader, arranger and conductor. Combine mastery of keyboard technique with decades of real world experience playing with no one less than the most celebrated artists of the last half century, and it’s no wonder Green has been hailed as perhaps the most exciting, hard-swinging, hard-bop pianist to ever emerge from Art Blakey’s Jazz Messengers. Green’s list of credits, accomplishments, and accolades could literally fill a book. His recordings with the masters form a foundation of jazz education. Some notable highlights include four years of touring with Betty Carter, becoming a Jazz Messenger, and being chosen as the first recipient of the City of Toronto’s Glen Gould International Protégé Prize in Music culminating in Oscar & Benny (1998). He has appearing on more than 100 recordings with legacy artists such as Betty Carter, Art Blakey & the Jazz Messengers, Freddie Hubbard, Bobby Watson, Milt Jackson, Diana Krall, and is particularly featured in Ray Brown’s trio series. As the leader of his own groups, Green’s has recorded Criss Cross: Prelude (1988), In This Direction (1989), Lineage (1990), Greens (1991), Testifiyin’ (1992), That’s Right! (1993), The Place To Be (1994), Kaleidoscope (1997), These Are Soulful Days (1999), Naturally (2000), Green’s Blues (2001), Jazz at the Bistro (2003), and Bluebird (2004). By the age of 18, Nash was a first-call sideman for musicians visiting Phoenix, and received the call to move to New York and join Betty Carter’s band at the age of 22. He became a highly in-demand sideman during this period, going on to record and tour with some of the most important and highly regarded musicians of all time, including Tommy Flanagan, Oscar Peterson, Sonny Rollins, Ray Brown, Gerald Wilson, Horace Silver, Ron Carter, Hank Jones, Benny Carter, Milt Jackson, Art Farmer, McCoy Tyner, Joe Lovano, Christian McBride, Branford Marsalis, Wynton Marsalis, Pat Martino, Clark Terry, Diana Krall, Joe Williams, Nancy Wilson, and many others. Though renowned as a master stylist, particularly in bebop and post-bop styles, Nash is seemingly at home in a wide range of stylistic territory, including funk, free, and Latin-based jazz styles, and his versatility has made him one of the most in-demand drummers of the past two decades. His style can be characterized by an unrelenting ride cymbal beat, cymbal crashes, crisp technical execution, a huge sweeping brush sound, and the use of three toms. Nash is also renowned in the jazz drumming community for his passion and dedication to jazz education, and has fostered the careers of a long list of young players. He is in high demand as a clinician and educator at schools, workshops, and major educational jazz festivals worldwide. He has recorded three albums as leader—Rhythm Is My Business (1989), It Don’t Mean A Thing (2003), and Stompin’ At The Savoy (2005). A world-class soloist, accomplished composer, and formidable bandleader, saxophonist Chris Potter has emerged as a leading light of his generation. DownBeat called him “One of the most studied (and copied) saxophonists on the planet” while JazzTimes identified him as “a figure of international renown.” Jazz sax elder statesman Dave Liebman called him simply, “one of the best musicians around,” a sentiment shared by the readers of DownBeat in voting him second only to tenor sax great Sonny Rollins in the magazine’s 2008 Readers Poll. A potent improviser and the youngest musician ever to win Denmark’s Jazzpar Prize, Potter’s impressive discography includes 15 albums as a leader and sideman appearances on over 100 albums. He was nominated for a Grammy® Award for his solo work on “In Vogue,” a track from Joanne Brackeen’s 1999 album Pink Elephant Magic, and was prominently featured on Steely Dan’s 2000 Grammy-winning album, Two Against Nature. He has performed or recorded with many of the leading names in jazz, including Herbie Hancock, Dave Holland, John Scofield, the Mingus Big Band, Jim Hall, Paul Motian, Dave Douglas, Ray Brown, and many others. Trumpeter Ambrose Akinmusire caught the attention of saxophonist Steve Coleman at just 19 years old, being hired as a member of his Five Elements band for extensive European tour. In 2000, he moved to NYC to begin a scholarship at the Manhattan School of Music, then returned to the West Coast in 2005 to simultaneously pursue a master’s degree at the University of Southern California in Los Angeles and attend the Thelonious Monk Institute of Jazz. After graduation in 2007, Ambrose won the Thelonious Monk International Jazz Competition and the Carmine Caruso International Jazz Trumpet Solo Competition. After making appearances on recordings by Steve Coleman, Vijay Iyer, Alan Pasqua, Walter Smith III, Josh Roseman, Esperanza Spalding, Aaron Parks, and more, Ambrose released When The Heart Emerges Glistening. Co-produced by Akinmusire and his labelmate and mentor Jason Moran, the album’s 12 songs (10 of which were composed by Akinmusire) feature the trumpeter’s young quintet of which The New York Times wrote that the group “seems destined for much wider recognition,” and described their unique sound as “limber, straight-ahead jazz with mystery and pop instincts that gets around most of the old, pervasive mainstream influences, both of trumpet playing and bandleading.” The New York Times also named the recording as their top CD of 2011. He was also dubbed one of the 2011 Faces to Watch by The Los Angeles Times. CAPA presents the Monterey Jazz Festival on Tour 55th Anniversary Celebration at the Lincoln Theatre (769 E. Long St.) on Friday, March 29, at 8pm. Tickets are $35 and $40 at the CAPA Ticket Center (39 E. State St.), all Ticketmaster outlets, and www.ticketmaster.com. To purchase tickets by phone, please call (614) 469-0939 or (800) 745-3000. Young people aged 13-25 may purchase $5 PNC Arts Alive All Access tickets while available. For more information, visit www.GoFor5.com.